A song that mixed country and rap has been removed from Billboard's country chart, despite reaching the top 20. Lil Nas X's Old Town Road has become a viral hit in the US, with social media support from Justin Bieber, Florida Georgia Line and Jake Owen. The song, which blends trap beats with banjos and lyrics about "ridin' on a tractor", is currently the third-most streamed song on US Spotify. The company, which compiles the US charts, did not publicise the change but told Rolling Stone the song was removed after a "review" of its musical merits. "While Old Town Road incorporates references to country and cowboy imagery, it does not embrace enough elements of today's country music to chart in its current version," it said in a statement. Lil Nas X has yet to comment, but posted Billboard's statement on his Twitter account, next to a sad face emoji. Country star Meghan Linsey was among those who leapt to his defence, calling Billboard's decision "BS". Old Town Road contains "plenty of 'country elements,'" she said, "and it's as 'country' as anything on country radio, tbh." It quickly went viral on the video-sharing app TikTok as the soundtrack to the #YeeHaw challenge, where users would film themselves transforming into a cowboy or cowgirl after drinking a beverage labelled "yee haw juice". The song subsequently racked up more than 35 million streams, earning it a place on Billboard's Hot 100 chart, where it is currently at number 32. While country artists like Colt Ford, Sam Hunt and Jason Aldean have incorporated the postures and cadences of hip-hop and pop into their music; rappers who travel in the opposite direction - such as Bubba Sparxxx, Lil Tracy and Lil Nas X - rarely get played on country radio. 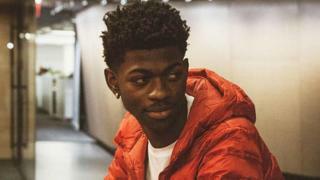 Several commentators suggested race was a factor in Billboard's decision to eliminate Lil Nas X's chart entry. Actor and poet Javon Johnson called the situation "problematic", adding: "There is a history there that can't be ignored." "What y'all did to Lil Nas X was TERRIBLY wrong and y'all are going to be flooded with racist tweets," said American Football player Deion Sanders. In a follow-up statement, Billboard said Old Town Road's exclusion "had absolutely nothing to do with the race of the artist".